The Keydex NFC Ring from Union Genius Computer, displayed at Computex 2015 in Taipei June 4, can transmit a user's profile information to smartphones via NFC. It can also be used to unlock phones, link to medical data and make electronic payments. If you've passed out from a health condition, you'll be pleased if you're wearing an NFC ring that can help first responders link to critical medical information -- simply by touching it to a smartphone. That's one of the functions of the Keydex NFC Ring being exhibited at Computex 2015 in Taipei this week. The accessory houses an NFC module that can also be used to instantly unlock a smart door lock or a smartphone, eliminating the need to tap in one's PIN. It's made of lightweight, sturdy ceramic that's waterproof to a depth of 30 meters and comes in a variety of colors and designs such as flowers, geometric patterns and medical red crosses. It could also be used to exchange profiles, like a digital version of a business card, as well as social media information such as Twitter handles and blog URLs. Additional functions include authorizing payments at shops and on public transit. 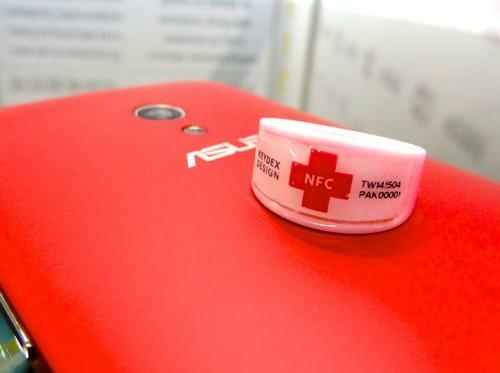 The NFC module's memory capacity is limited to 132 bytes, so only basic text data can be stored. For the medical alert function, the ring would transmit an Internet address containing health information so that a responder could see it on a regular browser. While that could pose a privacy risk, the ring has to be within 2 cm of another NFC device to work. At a demo in the Taipei World Trade Center, local maker Union Genius Computer showed how bringing the ring close to the NFC module on an Android smartphone immediately displayed profile data on the device, and prompted the user to save it in a preferred location. Users must first download an app from Google Play, touch their smartphone with the ring to activate the NFC module and then register their information. The Keydex NFC Ring is available on Amazon.com for US$24.99.